Organization: Set up as shown. Even amount of players for each grid. Instructions: Juggling Challenge to start. Different speed, agility, quickness exercises: sprint, forward shuffle, backward shuffle, bunny hops, ski jumps. Coaching Points: Footwork, on toes, knee ups, pump arms - relate to game, quickness with and without the ball. Organization: Set up as shown above. - Play 1 minute games of knee tag. Winner moves up league ladder, loser moves down. 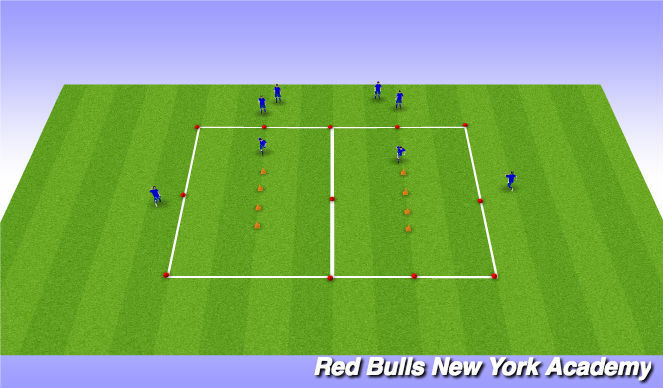 Instructions: - Defender plays to attacker then joins area and the two go 1v1 to the offset goals. Play until the ball goes out of play or a goal is scored. At that point next defender plays in to the next attacker. Game is continuous. Swap roles after 3 mins. - Front foot poke tackle when the time is right. Progressions: Competition between the two teams. Organization: -Set up as shown above. Instructions: - 2v2 on field. Each tim ethe ball leaves play a new ball comes in from the endline where resting players are stationed. Change players on field every 2 minutes. - Quick organization upon transition to defending. - Correct execution of 1v1 defending. - Quick transition between roles of first and second defender when ball is passed. Instructions: - Regular game rules. Coaching Points: - Look for players to utilize defending/pressure cover knowledge during scrimmages. Progressions: No progressions, let the players play and enjoy.